Grand, royal, majestic! 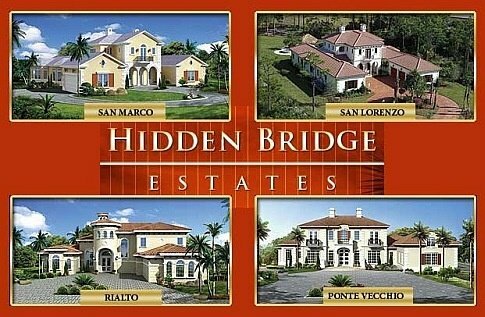 These are just a few words to describe the Hidden Bridge Estates located in Jupiter, Florida. Next to the Trapper Nelson’s Jungle Zoo and Camp lies a 30 acres patch of land that hosts the impressive residences of Hidden Bridge Estates. The community consists of 16 lots with more than acre of land each. The homes range from 4,000 to over 6,000 square feet of living space. The homes in Hidden Bridge Estates are distinct and unique from each other on the exterior and also on the interior floor plans. Hidden Bridge Estates provides homes fashioned after the modern classics – San Marco, Ponte Vecchio, and San Lorenzio, designed with thoughtful space planning in mind. The community is also separated by their own private gates. Prices start at $1,450,000. Residents enjoy privacy with 24-hour gated security. Hidden Bridge Estates provides the privacy of living in the country and the convenience of city living with shopping and restaurants just a few miles away. Hidden Bridge Estates has an incomparable combination of luxurious estates in Jupiter that offers accessibility to major destinations.